Presentations are made to serve various purposes. The presentations are of many types such as made to customer for selling a product, for demonstrating or promoting a product, for getting support for an idea or a cause, to give a status or progress report for a task, project or an activity, and for sketching the plans or strategies etc. An effective presentation is a powerful way of communicating a message or messages to a group of people and engaging the group with a two way dialogue. Giving an effective presentation is not just a matter of passion and power point. It needs concrete skills on the part of the presenter to keep the audience engaged and involved. The effective presentation is usually designed and customized for the formality of the situation and for the audience so as to keep the people focused and connected with the presenter during the presentation. An effective presentation serves the following purpose. It persuades the audience to take a desired course of action. Like any other activity, an effective presentation needs a thorough preparation which starts with a focused thinking. The objective of any presentation is to achieve the desired outcome such as to get the audience commitment, to the audience understand or learn what is conveyed, to persuade the audience to buy the idea or the product, and to make the audience to start a discussion or a debate etc. The presentations must include examples, visuals, and details to achieve the presentation’s objectives. Anything that is distracting, interfering or extraneous should not be the part of the presentation. A presentation is an interactive dialogue between the presenter and the audience. Hence it is necessary that the presenter understands the audience. The more he understands his audience the more he can customize the presentation. The important characteristics of the audience and the environment that the presenters should know to customize his presentation are as follows. Time available for the presentation. Presenter needs to adjust his presentation and presentation style to ensure that he achieves the presentation objectives within the time available to him. 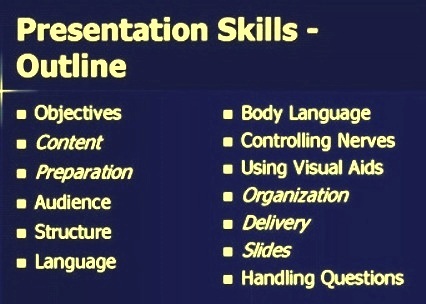 The selection of the presentation techniques which are best suited to capture the attention of the audience and to get across effectively the purpose of the presentation. Facilities available for presentation greatly affect the style of presentations. Facilities for presentation can range from blackboard/white board, flip chart, projector, over head projector, computer, video equipment, microphone, and pointer etc. The outline for skills needed for an effective presentation is given in Fig 1. Based on the presentation objective, the presenter is to decide the material for the presentation. For proceeding systematically for the material presentation, this activity is to be carried out in the following three stages. Stage 1- During this stage the presenter decides the message he wants to convey to the audience and the action which the audience should take. The presenter can have a number of supporting ideas, facts and arguments but he must have only one key message for the audience. This message should flow from the objective of the presentation. Stage 2 – During this stage arguments that support the message are to be identified. This is necessary since the statements without supporting argument or evidence are simply opinions. Further, though the excessive details are to be avoided, the presentation should talk more than just the plain facts. It should touch the emotional cord of the audience so that there is a forceful conveyance of the message. Stage 3 – The presenter should identify when it is important to get audience participation, reaction and agreement so that the audience get convinced with the message. After these three stages, the presenter should review the material and refine it. Effective use of data supported with arguments and combine with logic and emotions are necessary to make the presentation objective oriented. It must be kept in mind that extraneous details distract the audience from what the presenter wants the audience to hear, process, absorbs and remember. Persuasiveness in the presentation is necessary and this comes to the presenter through enthusiasm, credibility and personal belief in the subject. In the first step, the presenter should establish his credibility with the audience. Normally it is done by another person who has authority to introduce the presenter, to the audience. It should have a good opening. Good opening is necessary for getting the audience attention and for creating an interest of the audience in the presentation. Presenter must describe the topic of the presentation and describe very briefly the main points covered in the presentation. In the second step, the presenter describes the need or problem statement which needs to be solved along with the audience. Here the audience needs to be convinced and accept the message conveyed by the presentation. The presentation must carry the relevant arguments and a variety of supporting material to sustain interest of the audience without distracting from the point. The presenter makes audience interact to get a feedback which is to be considered if feedback is appropriate. In the third step, the presenter presents the solution of the problem. He helps the audience to visualize the benefits of the solution. All the presentations are usually allotted a time for presentation. Presentator is to ensure the presentation has the optimum length within the time allotted to convey the desired message to the audience. For this the presenter must know where he has to spend more time and where he has to gloss over the slides. It is always better to make fewer points but they are to be made well. If the presenter find the time a limitation to drive a point with the audience then he should request the audience to interact with him outside the presentation. Further two ideas or concept must not be clubbed in the same slide. Presentation should have enough visuals to make it more effective. It is a known fact that words along with pictures are six times more effective than the words alone. Visual aids are essential to keep intact the attention of the audience and to make them remember the message conveyed. All the visuals do not enhance the presentation with equal effect. To be effective, visuals should have the following characteristics. Use of pictures and colour enhances the acceptability of the slide with the audience. But the excessive use may have negative impact. VThe presentation must have a natural flow and there should not be a criss-cross of concepts and ideas along the length of the presentation. Presentator should give the presentation in relaxed manner without any tension and stress. Presenter should encourage the audience to be participative especially in the question answer session after the completion of the presentation part. Handing over the presentation handouts just at the time of the presentation distract the attention of the audience during the presentations. Handouts should be given to the audience either much before the presentations or just after the presentation.